Also known as Gastroesophageal Reflux Disease (GERD), acid reflux­ occurs when stomach acid travels upward into the esophagus. Millions of people suffer from this condition, many of whom experience heartburn — a burning sensation in the chest and throat. But not everyone with acid reflux will have these symptoms. I repeat, even if you have no heartburn symptoms, you could still have silent reflux, also known as Laryngopharyngeal Reflux (LPR). This common condition earned its name because is often unnoticed and undiagnosed. How can you tell if you have silent reflux? Do you have the need to repeatedly clear your throat or cough after meals? Do you find yourself frequently swallowing as though there is a tiny lump at the base of your throat? Direct your awareness to the base of your throat and pay attention to any subtle burning sensation that you may not have noticed before. All of these are signs of this overlooked condition. If not addressed, it can obstruct the airways during sleep and contribute to asthmatic symptoms. When acid reflux strikes, you want to fix it right away. The most common response to acid reflux is taking antacids such as an H2 blocker or proton-pump inhibitor (PPI). These drugs drastically reduce the hydrochloric acid produced by the stomach. Although they are not intended for long-term use, it is not uncommon for people to take them daily for years at a time. Many who have tried to stop taking an antacid after the recommended amount of time experience what is known as acid rebound, an intensified return of the symptoms. This results in continued dependence on acid-blockers to soothe discomfort. The cause of acid reflux is not too much stomach acid — it’s too little. Read on to find how this is the case. When food is introduced to the stomach, hydrochloric acid (HCl) is secreted. This natural process is necessary to break down our food into smaller components so it can be properly absorbed in the intestinal tract. At the bottom of the esophagus is a ring of muscle (sphincter) that closes in order to keep the contents of the stomach from surging back up during this digestive process. The production of hydrochloric acid in the stomach stimulates a signal for the lower esophageal sphincter to contract. When there is insufficient stomach acid, the signal is too weak, and the sphincter remains partially open. Antacids do not address the problem of the muscle not closing. Instead, they deplete stomach acid to such a low level that it is not noticed. With the surge in popularity of “alkalizing” in recent years, it is easy to overlook the essential roles of organic acids in our health. The stomach functions most efficiently with a pH of around 2. That is very acidic. When stomach acidity is too low, food cannot be broken into smaller components efficiently. This can lead to the fermentation of food in the gut, which creates bloating and gas. Low stomach acid also interferes nutrient absorption, contributing to deficiencies in B12, magnesium, and many other key nutrients. The stomach becomes a breeding ground for harmful bacteria, which can increase the risk of clostridium difficile (C. diff.) and small intestinal bacterial overgrowth (SIBO). What Causes Low Stomach Acid in the First Place? One of the greatest contributors to an imbalance of stomach acid is chronic stress. You’ve probably heard of the “fight-or-flight” response. This is the activation of our sympathetic nervous system. We were not meant to remain in this state of nervous tension because it wreaks havoc on our digestion. However, we do this all the time because we are often in a rush, constantly fretting about our next task or obligation. Take some time to relax and just breathe, or make a cup of tea. Another major cause of low stomach acid is a diet high in processed foods and sugar. These contribute to bacterial dysbiosis, mineral deficiencies, stress, and inflammation. There is a difference between feeding and nourishing ourselves. Everything you eat and drink affects your health in some way. Having a diet full of fruits, legumes, (c)lean proteins, legumes, nuts, and seeds. The most effective solution for a failing stomach with too little acid is to replenish the HCl that should be there. Balancing the stomach’s pH is the most sustainable approach to the problem of acid reflux. This is where betaine HCl comes in. This supplement is a combination of betaine, a compound found in plants, and hydrochloride. Research has shown that betaine HCl effectively adjusts the acid content in the stomach to a healthy level. This is a short-term therapy that promotes long-term wellness. Lifestyle changes help too. The best foods come from the earth. A diet rich in antioxidants, complex carbs, and healthy fats from plants can help to bring balance to an ailing body. Acid reflux is hard to live with. Antacids provide only fleeting relief while keeping stomach acid dangerously low. Rather than masking the symptoms, it is better to correct the underlying issues. The more health conditions that can be eliminated or managed naturally, the less reliant you will be on over-the-counter and prescription drugs. 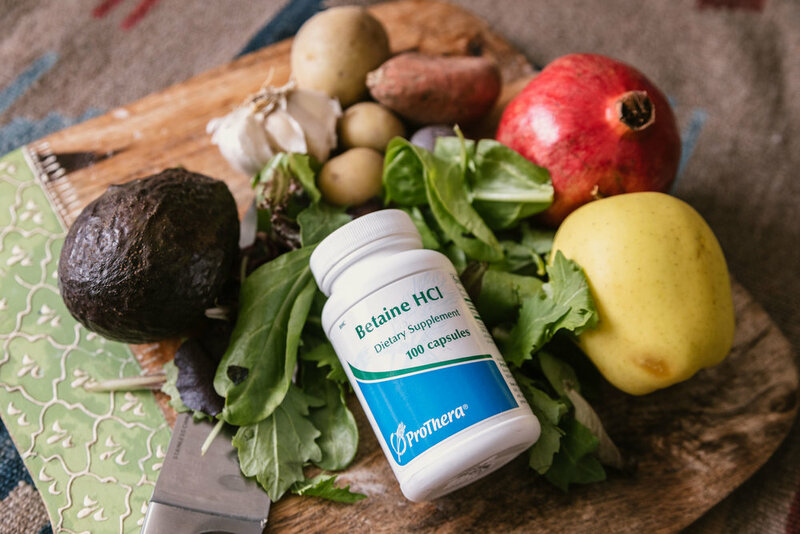 Betaine HCl supplements to correct the pH imbalance within the stomach is a good start. Many people begin by taking betaine HCl. Then, maintaining healthier daily habits by managing stress and cleaning up your diet can further improve and restore digestive health. Again, the best foods come from the earth. Once the root cause of an illness is addressed, a plant-based diet rich in antioxidants, complex carbohydrates, and healthy fats can help to continually optimize health. Did you find this information helpful? Let us know what else you'd like to see us talk about on the blog by leaving a comment below.